It's that time again... You know what time it is. Let's get going. If you're reading this, it means the rebels failed again. The CODE always wins. Always! Sometimes I feel like we need a wiki to keep track of the backstories of all these anti-Code people. All I know is, at a certain point, Codex Biovector became a thing in the comments section. A new challenger has entered the ring! Don't get too excited, though. The corp only has one member. At least he called him an Agent. Still, carebears can be such downers. An argument broke out between Agent Ralliana and Mr Jawa, who was convinced Ralliana couldn't use a ship in highsec. Some carebears don't accept the reality of EVE's game mechanics, even after witnessing said mechanics and losing a ship to them. They think if they argue enough with our Agent in a private convo, their ship will reappear and be waiting for them in their hangar. Mr Jawa lost everything he owned... but he gained a friend. 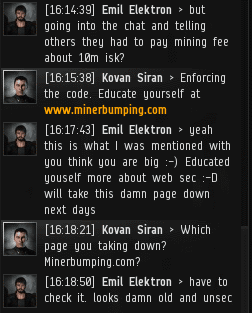 Thryll Simms reported a bot fleet to our Agents. Thryll became cynical when they didn't immediately gank all the bots. Classic carebear: They get mad when we gank, they get mad when we don't gank. 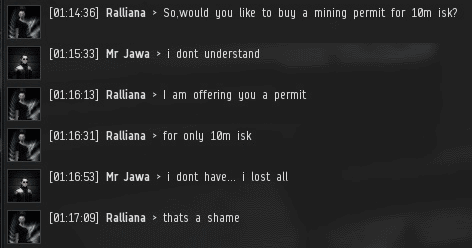 Never trust a highsec miner--especially if he doesn't have a permit. They'll sell out anyone, even their own children. Here we see Heliocentristic Chastot throwing his dog under the bus instead of accepting responsibility for going AFK in an asteroid belt. There's a reason dog is man's best friend and not "bot-aspirant's best friend". Agent Snigie Audanie returned to his keyboard and, like the professional he is, calmly got to work dealing with the ruckus in local. Carebears can be so forgetful. We're about to see another reason why the CODE always wins (always). Can you guess what it is? 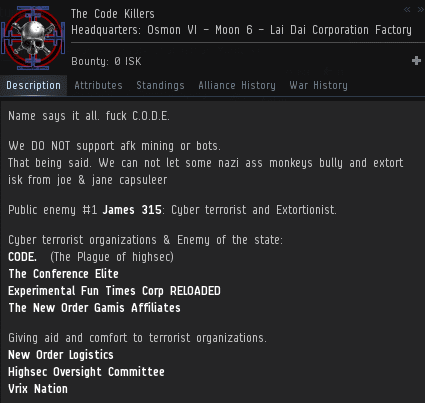 The New Order knows how to have fun playing EVE. This gives us a distinct advantage over our enemies. 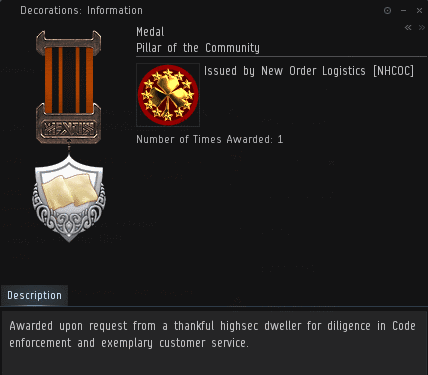 Congratulations, Agent Tisi; well deserved! Damn I miss fighting you guys :( You gonna be coming over to Star Citizen? Have you identified a need for the Code there? Is it swarming with bot-aspirants? Speaking of other space MMOs, what's your and/or the New Order's opinion on Elite Dangerous' general state of lawlessness? And anyone can play in "offline mode" at anytime to avoid PVP but still affect the market/influence by doing pve trades. No thanks, ED is less "elite dangerous" and more "erectile dysfunction". Fuk frontier games, they ruined the potential of that game to cater to scared little carebears. The hilarious thing is, though, that even in solo mode, NPC pirates still spawn, even in high-security systems. They can also pull targets out of Supercruise(Elite's version of warp). Against anyone even remotely skilled at initiating/evading interdiction, it doesn't work. Against anyone remotely skilled in combat, the pirates die. But carebears are neither of these things, and often strip out their shield generators to fit more cargo, which is f**king stupid, because once your shields are down, enemies can damage your modules directly. So whenever they get interdicted by NPC pirates, they lose almost everything they were carrying. Still wish that the SDC hadn't chased them all out of multiplayer, though, because it's basically impossible to pirate players nowdays. Though having 12x more systems than there are humans on Earth didn't help either.